We had an excellent Memorial Day today, which just so happened to fall on mine and Dustin's 7th wedding anniversary. We spent the day with our families and friends and attended parades in both Wooster and Nashville. Matthew was really interested in the parade this year (last year he was only 9 months old) and he waved and in his sweet, soft voice called "hi" to many of the folks in vehicles, members of the marching bands and especially to the horses. Luke was too small to notice much of the parade and he was happy to be snuggled regardless of his surroundings. It's hard to not get caught up in the patriotism of the day and I was brought to tears during the parade in Wooster when a man dressed in black (following a float with names of fallen soldiers posted to a simple board) read the names aloud from a book. It's hard to imagine living in a country that didn't offer the rights, liberties and safety that we are afforded here in the United States. I am so grateful to the men and women who have, are or will serve in the Armed Forces and especially to those who have paid the ultimate sacrifice for my freedom. We traveled to Dublin on Wednesday for a second opinion from an ENT within the Nationwide Children's (Columbus) network. This doctor was a referral by a new friend in our local community. He completed a nasal scope on Luke and believes that he may have a small amount of laryngomalacia, however with the absence of him having a stridor, he has ordered that he have a fluroscopy completed next week to obtain a better appreciation of what's happening inside Luke's airways. He recommended that we complete a bronchial scope prior to Luke having open heart surgery to validate he will be able to tolerate and more easily come off of the ventilator when the time comes. Because Luke has been overusing his right hand and also has had some staring spells (which I think may have been more from just being startled or possibly because he was working to focus his eyes), his Neurologist ordered an EEG and Brain Ultrasound. Both of those were completed this week and fortunately they both were considered to be within normal ranges and negative for a prior infantile stroke and / or infantile spasms. On Thursday, we went to Cleveland for a follow up with Luke's hematologist. She ordered another CBC and it showed us that Luke's Absolute Neutrophil Count (ANC) was up to 1100. A normal ANC is 1500, but 1100 is within an acceptable and healthy range. We have agreed to a monthly blood draw to check Luke's CBC once per month for the next few months. This may be TMI (because it's about baby poop) , but it's from a conversation thread I started on a closed Facebook group that I'm a part of for moms of babies born in 2012 and 2013 with Down Syndrome. I'm saving it here, because it's easy to lose stuff on Facebook and I'd like to be able to come back to this later as we get further down the road with his ANC and his stinky, shiny poop problems... (for my 12/13 moms, hope you don't mind me sharing this... I made your names generic to protect your privacy). Me: I should also add that we had it tested for blood and it was negative. Mom 2: My daughter has green poop almost always. She gets half breastmilk, half formula and still has seeds. Occasionally, she will get mustard yellow, but it's almost always light green and it stinks!I would also say that her poop smells worse than my toddler who is on all kinds of solids, but I think it's because hers is so liquid so I spend more time wiping. Mom 3: Well that pretty much described my son's poo for the last 6 months. He would go almost 5 days without pooping and we are down to every 3 days. Dr prescribed lactoloose but I haven't given it to him since he's gotten better. I can always tell when he is ready to poop cuz he starts to grunt and his gas is awful. Lol solids have helped but I have bananas and it stopped him up! The only thing my dr said to watch for if he is in pain when he poops. Me: Luke is only going once every 3 to 5 days too and also has really fowl gas... Like its so bad it's almost embarrassing... How old is your little guy? Mom 4: Kristen, I think your little man is a mirror to my son ...neutropenia and all. Right around the same age as your little guy my son's poop turned what I called black. We had it tested for blood three separate occasions, iron twice and all negative. Then gastro just blew me off. My uncle told me to have them check for a fatty acid malabsorption if it was "greasy" which it sometimes was (he is internal med md) but I couldn't get anyone to test for that since they said he was gaining weight he couldn't have malabsorption. Which I think u can but no one would listen. We just saw gasrto yesterday for other issues but she is testing brodys pancreatic function because there is a condition in which the pancreas isn't doing what it should with enzymes that can cause cyclic neutropenia and " greasy/oily" stools. Maybe check ok that. Good luck. Hope they listen to u!! Me: Our hematologist suggested the malabsorption possibility for greasy stools, but he is also gaining weight and tracking well on the growth chart so we haven't gotten too concerned... He seems to be thriving in all other areas (although he does have AV canal). Do you know the name of the test for pancreatic function? Mom 5: We had the exact same issue and were super-worried. I cut dairy/ switched him to soy and it continued. Finally got him on nutramigen and he's 10x better...we suspect he has a severe milk and soy allergy. He also had a terrible rash, bloating, and vomiting, all of which improved with the hypoallergenic formula. Have you tried changing his diet? Shameless plug in favor of cloth diapering... This diaper is a Bumgenius 4.0, shown in a fun print called Irwin. We have a couple in this print and since the boys were both wearing one at the same time, I attempted to get them on the floor together to take some photos. Matthew is just too busy to sit still long enough for me to get many worthwhile shots, but still I thought I'd share the few I captured. I think it's really cool that one diaper style can be versatile enough for us to use with both a 5 month old and with a 22 month old (especially considering their differences in size/weight and level of activity). We have been at cloth diapering for probably at least 3 weeks now and I'm happy to say that we haven't had any issues with leaking. Don't these two have just the cutest little bums? We visited a friend's Jersey farm today and since "barn" clothes seemed pretty appropriate (and we had some in the right size), I dressed Luke up in some Carhartts for the occasion. He just looked too cute for me to pass up the photo opp! P.S. I'm happy to report that I think my photography skills have improved some since then too! Luke is 5 Months Old! Here are some photos of our sweet boy ... the day he turned 5 months old! I can't believe we are nearing the completion of Luke's first half year in our lives! Check out all of my new red hair! Making the cutest pouty face ever! Mom, seriously. Enough with the camera! Aren't those just the sweetest lips? I know I'm not supposed to compare, but I keep seeing all of these babies who are close in age to Luke and they appear to be ahead of him with their gross motor skills. I know I don't have a reason to be sad, but still... In some ways I am. He's working so hard. He has a lot of persistence and stamina and even while working hard, he rarely loses his big gummy grin. On the surface I know this is our reality, I know Luke will get there in his own time, but its still hard to think that my sweet baby isn't keeping pace with others his age. Living life with Luke is teaching me a greater patience than I ever knew existed. He is teaching me about what it really means to live to your greatest potential and regardless of where he finishes each day's race, its amazing how he seems to be at peace with his progress. I'm not one to keep score. I'm not one to judge. And most days I'm content... On nights like tonight when I feel anxious about what our future holds, I will remind myself to take my cues from our special gift. Our life will be a good life. 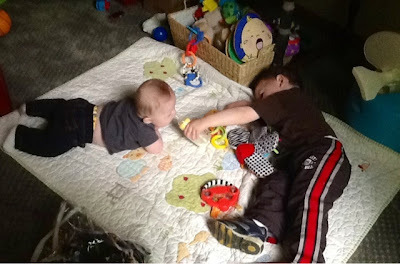 Matthew noticed Luke hadn't completely finished his bottle this afternoon so while Luke was practicing tummy time, Matthew took the bottle to him so he could finish it. He even sat with him for probably close to five minutes while he coaxed him to eat the final ounce. It's really fun to watch Matthew play the role of "big brother"! I really want to try this recipe! Thought I'd save it here as a reminder! I remember researching cloth diapering before we had Matthew and thinking, who in the world would be crazy enough to want to use cloth diapers?!? To start with, they are expensive, they add more laundry and to top if all off, they are really just all around kinda gross. Disposable diapers are expensive too! With two kids in diapers, we were spending between $60 and $80 per month buying 'sposies (that's how the cloth diapering mamas in the online community refer to them). Our sitter doesn't do trash pickup, but instead does a lot of recycling and burns whatever is left over and since plastic diapers don't burn, they sent them home with us... that left us with close to 12 (or sometimes even 15) dirty diapers to get rid of at the end of the day... since I vehemently refused to buy a separate trash can for diapers (aka "The Diaper Genie") they have always gone in our kitchen trash... which wasn't a big deal with one kid, but now with two - it's stinky and gross. Then there is the issue of getting the diapers to your house. When we just had one in diapers, it wasn't a big deal to buy the large (and more economical) box at Sam's Club - the problem is that it's hard to fit two economical size boxes in a mid-size sedan in addition to two car seats and other goodies from said shopping trip. Since that wasn't going so great, I tried Amazon Mom for a few months, but there is hassle with that too... you have to go in month to month to validate your monthly shipment will contain the right sizes and then if you're running short with your supply at home you have to go out to get a small bag of diapers to hold you over or you try to move up your shipping date if you have enough time... With cloth diapers, you just throw them in the washer and use again. No biggie. In addition, I've heard that it can be harder sometimes to potty train individuals with Down syndrome so if Luke does need to be in diapers longer, this will be a nice way in the long run for us to save money from having to buy diapers for an extended period. Best of all, these colorful little "dipes" (another cloth diapering slang term I've recently added to my vocabulary) are so fun to put on and take off our little people! They definitely make changing a diaper way more cheerful and happy! I have no reason for sharing this other than "just because" Matthew looks so incredibly cute! He's sporting Daddy's slippers and a hat that his Mimi picked up for him at Goodwill. I forgot how fun it is to play "dress up"! We spent some time playing outside this afternoon. The weather was just about perfect and after Dustin stained the deck earlier this week, it was really nice to have time to enjoy the warm breeze and admire the "refreshed" look outside our back door. We had a busy day today with appointments for Luke. We started off for the Cleveland Clinic around 7:45 this morning and I was joined by one of my past 4H-ers, Tessa. Tessa is a college sophomore now and she agreed to spend the day with us so she could help me with Luke. I hurt my back over the weekend and have been having trouble with bending and lifting, both of which are required for getting Luke's carseat in and out of the car. Not only was Tessa a big help, but she was also great company and I really enjoyed getting to spend the day with her getting caught up! Our schedule today included visits with neurology and developmental pediatrics. We were referred to neurology because when Luke was between 3 ½ and 4 months old, we noticed him overusing his right hand. Babies are supposed to be ambidextrous until they are at least 18 months old (if not older) so a tendency to use only one side of their body could indicate an infantile stroke or another neurological issue where the brain was missing some connections. I also shared with the doctor that I’ve observed him staring into space sometimes – I know that infantile spasms or seizures are more common in the Down syndrome population and in the back of my mind, I can recall seeing some red flags – that said, I’ve read that we are supposed to watch for cluster like jerking motions and I’m happy to say that I’ve never to my knowledge witnessed them before. The doctor was pleased with Luke’s cooing and his ability to vocalize and he also made nice comments about his head and neck strength. All in all, he thinks that Luke seems okay, however he has ordered an EEG and brain ultrasound for next week to validate there isn’t something going on that we aren’t able to observe. Fortunately we were able to schedule these tests for next Thursday when we already had planned to be back at the Clinic for a follow up appointment with Luke’s hematologist. We scheduled a follow up with neurology a few weeks from now and discussed a “heart and brain clinic” approach they take in their office for kids with congenital heart defects… a clinic that Luke will be invited to participate in. Basically, research shows that children with congenital heart defects are also up to 50% more likely to have learning disorders – being congenital, the heart defect happens for the baby while it’s still in utero. Apparently there can essentially also be congenital-type brain issues that are related to that early mis-development that results in the heart defect. We know Luke will have some level of learning disability with his Down syndrome so we are a little different than some other patients that they will see in the clinic. The clinic will be set up with various disciplines of pediatric medicine who will examine Luke and consult with us on his progress. They will also routinely administer a standardized learning test called the Balyley Scales Test, beginning a few months from now. How he scores on this test will help us identify how to better assist him in his therapy sessions. Next we drove down to Strongsville to meet with a Developmental Pediatrician. Like her title says, she is a pediatrician who specializes in children with developmental delays and disabilities – generally, she works with individuals with Down syndrome, Autism, ADHD, ADD, etc. She commented on how great Luke’s muscle tone is… actually describing it as normal-low or maybe even just normal compared to typical children. She also indicated that Luke exhibited great eye contact (poor eye contact could be an early indicator of Autism, which is up to 10% more prevalent in children with DS). She really didn’t have anything new to add other than we discussed the need for Luke to see a pediatric ophthalmologist to get his eyes tested. Cataracts are more prevalent with individuals with Down syndrome so getting him tested is really important. Obviously you need all five of your senses to best explore the world around you and to learn about your environment – if Luke does have problems with seeing, we want to make sure to get him glasses to help him correct the issue. Not that I want to deal with the hassle of an infant in glasses, but they are so stinking cute that if he has to have them, I’m sure we can make the most of it! We did learn that Luke continues to grow – he weighed in at 14 pounds, 3 ounces and measured 24 inches in length. This doctor also shared that the Clinic is working on organizing a Downs Clinic… similar to the heart and brain clinic mentioned above, but this one would be specific to Luke’s DS. The doctor mentioned they are in the early stages and that they will eventually be looking for a parent advisory council to help them as they get organized and she mentioned that if I were interested in being a part of the group, she would be happy to put my name on the list! How exciting! I would LOVE to get involved in a cause that could potentially help my son and would definitely help me to build my network with medical professionals and other parents of children with DS! It was a long but good day! Upon arriving home, one of Luke’s physical therapists visited for her weekly session and we called it a night. I was so grateful for us to get good news during our appointments and really enjoyed spending the day with Tessa too! I only wished I would have taken a picture of her and Luke to share! Matthew has started putting two words together... I can't believe he will be talking in sentences before we know it! Over the weekend, he saw a school bus in a parking lot and he called out "bus!" from his carseat and as soon as we had passed the school he followed up with " bye bye bus!". I was excited and promised myself I'd write about it when we got home, but I forgot until Dustin shared that on the way home from the sitter tonight Matthew did the same thing as they drove up to a field with Holsteins in the pasture, but tonight it was "cow, cow" and then " bye bye cow". He seems to have a really good vocabulary and if he doesn't know the word for something all you have to do is tell him once! Matthew will be 21 months old in just over a week. Dustin pulled his 1985 Chevy pickup in the Wayne County Truck and Tractor Pull at the fairgrounds. Matthew was 9 months old and somehow I managed to get him to fall asleep wearing these bulky and somewhat un-stylish "Peltor Junior" earmuffs during the pull. While he was awake, he sat on the ground and crawled around in the dirt as he played with our friend's little boys and their miniature tractors. Our life was wonderful, but it didn't yet feel complete. Dustin and I both were hoping to eventually have another child (and maybe even more than just one.... someday). I will never forget while we were at the fairgrounds, one of Dustin's friends - also named Dustin or Dusty for short - jokingly asked me if I were ready for another baby. I told him YES! I was ready for another... although I was only being half serious - I did want another baby, but I was thinking that it would be a while before we'd be going down that road again. We attended an annual chicken dinner fundraiser and after sensing that something "wasn't right", I asked Dustin to stop on the way home so I could pick up a pregnancy test. Within an hour I learned that I was expecting another baby. We weren't really trying to have another child and we were shocked to say the least. The first thing I did when I read the positive result was laugh out of excitement and joy and within seconds, I was sitting on the floor of the bathroom in tears. Soon I was laughing again and then before I knew it, the tears were flowing. I felt like having another baby so soon would force us to miss out on the wonder of Matthew - that we'd be so focused on yet another child that we'd have less time to spend with our precious baby Matthew. At the same time, I was overjoyed at the prospect of growing our family - of giving Matthew a sibling, someone he could grow with - someone who he could argue with, wrestle with, play with, help and above all else, someone he would love. It's hard to believe all that we've encountered in the last 365 days. Some days it's still hard to believe that I have a son with Down syndrome. It is definitely hard to believe that I have two children, I certainly don't feel old enough for that. Later this month, Dustin and I will be celebrating our seventh wedding anniversary and I don't feel old enough to have been married that long either. It's really amazing how life works, how two people can create another life and how the physical and mental aging process affects a being over time. It's just been a year, but I'm a different person than I was last May 4th. I may be older and I think I'm wiser, but I know I still have so much more to learn and experience. For the rest of my life, I will always remember December 17, 2010 - the day we learned that we were expecting baby Matthew - the son who first filled my heart with so much love and joy and May 4, 2011, the day I learned that a heart already so full could stretch enough to give that same kind of love to a second baby, a boy who we would later name Luke... a baby who would change me in ways I never imagined possible. Life is so amazing and we are so deeply blessed! Dustin and Matthew are running errands in wooster and I'm alone with Luke this morning. The house is quiet. Luke is asleep right now and resting on my shoulder. His little body is warm and limp and restful. He is a welcome weight on my chest. This morning, I'm drinking a cup of coffee (lovingly made and delivered to me as I sat in the recliner by my husband) and I'm reading "A good and perfect gift" by Amy Julia Becker, a story about a mother who learns at birth that her daughter has Down syndrome. I'm only a few chapters in at this point but I had to stop and share this part... After learning of Penny's diagnosis, one of Amy's friends called her, they shared tears and the friend reminded her of the verse above from Mark. As I sit in my chair this morning, cuddling with sweet 4 month old baby Luke, listening to birds singing outside and watching them as they hop across the branches of the blooming crabapple tree in our front yard, I am filled with His presence. It is so wonderful to know that I am loved beyond measure by God. I am blessed! What a wonderful way to start the weekend!! A moment passed and when I looked back, I found Matthew crouching near the swing, covering up his baby brother. Who knew at only 20 months old, he could be so thoughtful? Matthew is all boy. He is constantly on the go. If he's not moving, he's talking and he's talking a lot these days. For months now, I've missed the times when he used to just let me hold and cuddle him close (that ended when he realized that he could crawl). For some reason, I've seen some of who I remember fondly as "baby Matthew" come to life lately. Even if it's only for a few minutes, he's been willing to sit in my lap more often and a few nights ago he even asked me to "rock rock" him before it was time to go to bed. Also one night this week since Dustin had other plans and didn't get home until late, I took Matthew to bed with me - hoping he would be willing to cuddle. I was expecting it to last a couple of minutes and for him to end up back in his crib, but he surprised me! He actually did fall asleep with me and stayed there until his daddy came home and moved him to his crib. The best part about the whole night was right before he fell asleep, he kept toggling between restlessness and peace and with that came him throwing my arm off... but a few seconds later, he'd reach out in the darkness, trace my arm until he found my hand... he'd loop his fingers around mine and pull my arm back around him to cuddle... this happened at least 4 or 5 times so I know it wasn't a fluke. My big boy still needs his mom. [insert a sigh of relief] Sometimes it feels like the world is moving too fast and time is slipping away too quickly and then a night like that reminds me how important each age and stage is with our little people. I am blessed. 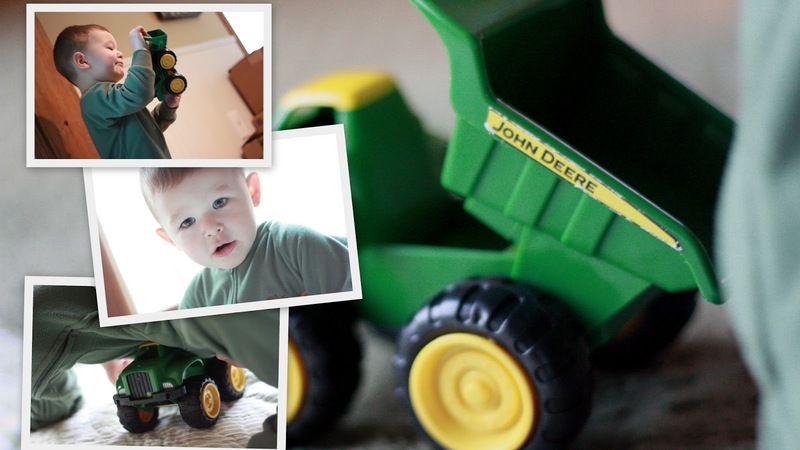 Here are some photos of my big boy playing with his trucks this morning!